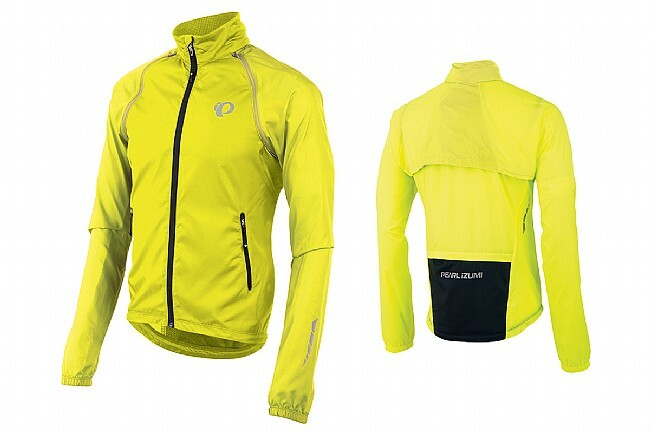 Pearl Izumi's Elite Barrier Convertible Jacket quickly turns from wind jacket to vest for changing weather conditions. The zip-off sleeves double as additional vents when worn as a jacket, but if all that's needed is a little core insulation, undo them completely and store them in the back pocket or one of the two front pockets for the rest of the ride. The ELITE Barrier fabric provides superior wind and water protection, and Direct-Vent panels on the vest ensure excellent ventilation so things don't get too warm. Cut in a semi-form fit. Features reflective accents for increased visibility. Available in multiple colors. Inexpensive, quiet, works great as vest. REALLY VISIBLE. Yeah the velcro may not be the greatest - but good enough, knowing that just treat it kindly and you'll be fine. An overall great value. The jacket does what's supposed to do, to wit, to offer protection from the world beyond its wearer, and do so in a wide range of temperatures. I know there's been some complaints about grotesquely long sleeves and sizes not matching the description. My jacket, though, fit me as described. It's also a snug fit, so anyone with a sizable paunch, this jacket may not be the right fit. The jacket fits into its own pocket - there are three welcome and generous pockets on the back and two smaller pockets on the front. It will slide into a jersey pocket. Material is lightweight, but not overly so. A jacket with a thiner nylon won't work well for a long descent on a frigid day. It wouldn't work with cold temperatures and cold winds on the flats, either. I know this is so because I have some very thin cycling jackets that don't come close to working as well as the Elite jacket when temperatures head toward the deep south. By the same token, the zipper isn't heavy duty, but it's plenty robust enough to instill confidence that it won't fail when it's most needed. And it's true, it's easy to convert from a jacket to a vest and back again. Will the Elite jacket keep you dry in a downpour? No, but it's not designed to do that. Even in a deluge, though, it will offer some protection from heat loss. I know this from personal experience, too, over long years of cycling. (Arm warmers or a long sleeve jersey should be worn in truly inclement conditions, though, as even form fitting nylon against bare skin will be uncomfortable). I know yellow is probably the safest color in traffic and probably the most popular color. Mine's in black and grey, though, and it's reasonably stylish - I might not wear it to dinner at a swank eatery - as well as functional. I the jacket deserves a five star rating. My husband always admired my PI jacket with removable sleeves. So I purchased this for him this Christmas. He loves it. It's perfect here in Seattle where the weather can be quite cool in the AM but warms quickly once you start riding. The bright yellow is essential for visibility in the crazy traffic but also on the rural roads. The only improvement I would suggest is to make the torso longer by at least 2 inches. The extended rear keeps the back covered, but a little more length would be great. He wears a size L which fits his slim, broad shoulder frame, but he's only 6' tall yet the length is barely long enough. Size runs large, not good for cold temps..
As with every P.I, clothing item I have worn, sizing seems to run all over the place. This jacket runs about a size large. I have ordered other P.I, jackets in size XL that I could not even zip up. I love the screaming yellow color. O.K. for mild temps, not good for anything below 50, unless you want to layer up like the Michelin Boy. Other than that, the quality is excellent. If you need a light wind jacket that converts into a vest, this will probably work for you. Just be aware of the sizing. Sizing of jacket is too small, I own an older model Pearl Izumi convertible jacket vest in XL, it fits very comfortable, even a little baggy. So I ordered this one in XL same brand same jacket, the new one is way to small to wear, not even close. I have been looking for a light weight wind jacket for those early morning/late day rides when the weather is cooler. This product meets my needs to a t! Got it at a fair price to boot! Really nice light jacket. Made from very thin material but still blocks the wind. Packs small. Snug fitting. If you are close to a size, you may want one size larger.